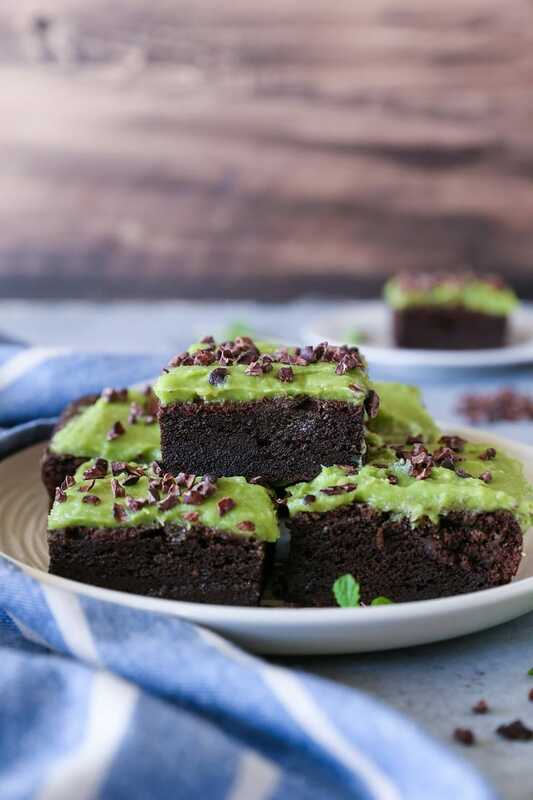 Chewy fudgy cassava flour mint fudge brownies made with coconut oil and erythritol for a grain-free, dairy-free, low-carb, melt-in-your mouth treat. Hear ye, hear ye! You’re about to embark on my maiden voyage with both cassava flour and erythritol! True story. I went to new-to-me uncharted territory in the preparation of these brownies. This recipe marks my first go at baking with cassava flour, and also the deflowering of my erythrtiol…flower. …And you guys, I couldn’t think of a better introduction to the two ingredients than with these super fudgy melt-in-your-mouthy über chocoalty and Minty McMintsalot mint brownies. You’re still stuck on “deflowering,” aren’t you? I know…there’s no going back, but for the time being, lettuce proceed forth. Lately, I’ve been tinkering around with my sugar intake. I love me some sweet treats and am a huge proponent for feeding the sweet tooth, but I’ve found I’m particularly sensitive to all sugars, whether they be refined, all natural, or even just fruit. Regardless of the sugar type, it tends to affect my digestive system and mood more than I’d like it to. One standard-sized dessert and I become sluggish almost immediately, irritable, and my digestive system suffers. Case in point: I’ve found my mind, body, and soul body function supremely better when I’m cautious about the amount and type of sugar I consume. Let me preface this discussion by letting you know I’m not at all trying to sell you on sugar alcohols. Some people love them, some people don’t. If your body functions fine with other types of sweeteners, there’s no need to fix what isn’t broken. End disclosure. Even though I’ve been aware of the existence of xylitol and erythritol for years, I’ve been hesitant to incorporate them into my baking for the sole reason they undergo more processing than unprocessed sweeteners. As is the case with all of the foods I consume, if I can’t understand where it comes from, I generally shy away from it until I know more. After doing some research and coming to my wit’s end with other sweeteners, I finally decided to take the plunge with sugar alcohols. So, I ordered a bag of Swerve Sweetener, which is an erythritol-based natural sweetener, off of Amazon. I first heard about Swerve from Carolyn Ketchum’s blog, All Day I Dream About Food. 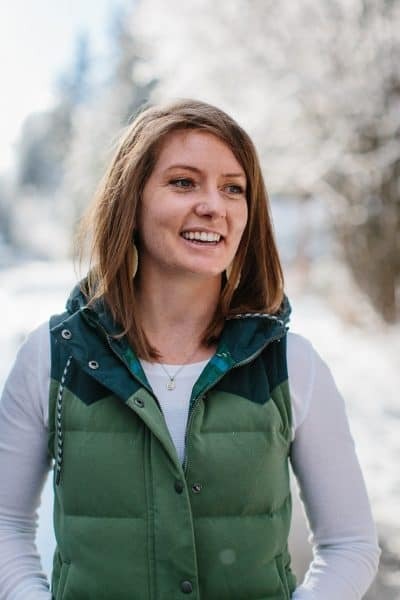 She makes low-carb recipes for health reasons using Swerve almost exclusively as the sweetener. I had a chance to meet Carolyn when she and I were on the same tour visiting Bob’s Red Mill a couple years back, and she gave me the full rundown on how it all works. Super cool chick, too! If you’ve never heard of erythritol, it’s a sugar alcohol resulting from fermented glucose. Plant matter such as cauliflower, peaches, etc goes in, and a no-sugar substance comes out. Essentially, the fermentation process of glucose (just like any fermentation process) removes the sugar, but you’re still left with something sweet…in this case, the end result is a sweet granulated substance that happens to contain 0 calories and 0 grams of sugar. In this sense, erythritol will not spike your blood sugar (it’s a choice sweetener for folks who have diabetes), shouldn’t wreak havoc on your mood, and also won’t cause tooth decay. You can use it as a 1:1 replacement for granulated sugar in any recipe. I WILL SAY THOUGH, all sugar alcohols, including xylitol and erythritol can act as natural laxatives if you consume too much before your body gets used to them. In this sense, easing into the sweeteners and not going too hot out the gate is the wisest choice. The verdict on me v. erythritol? So far it seems like I can tolerate it… but not in high quantities. It doesn’t make me crabby or zap my energy the way other sugars do, but it does give me tumble guts when I overdo it. You’re welcome for the overshare. Side Note #1: if you have any sort of digestive issues processing carbohydrates (if you’re sensitive to FODMAPs or have SIBO, you’d still want to avoid sugar alcohols just like you would other sweeteners). If you have any dietary issues whatsoever, I’d do some research before jumping into sugar alcohols to make sure it won’t aggravate your condition. Side Note #2: Sugar alcohols are not widely embraced by the Paleo community. You may read mixed reviews as to whether or not they’re acceptable, but the consensus seems to be if you don’t need to use them in your baking, don’t. We’ve covered the erythritol topic, and you may be seeing it again in future treat recipes. All you need to know now is the ins and outs of these brownies. MYLAW they’re amazing. I used cassava flour and coconut oil for the brownies, which results in a light yet somehow dense, kind of spungey yet fudgy texture. The texture doesn’t come close to brownies using all-purpose flour, so bare that in mind if that makes a difference to you. 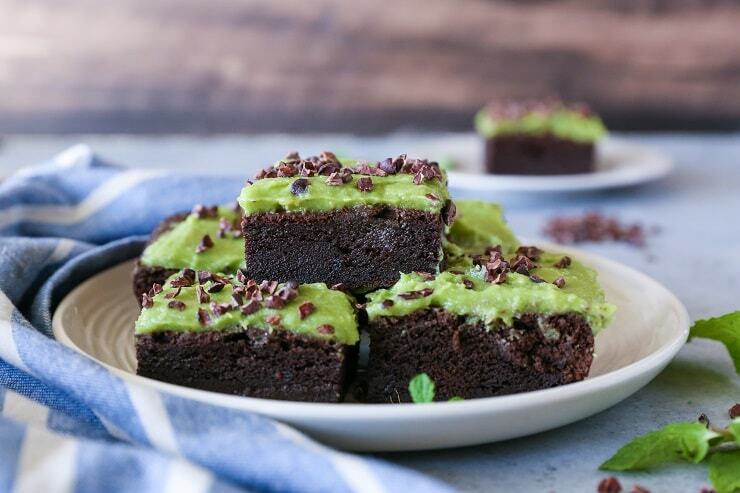 They do contain all other brownie essentials: they hold together well, are moist, easy on the palate (dude, they’re delicious), and greet your mouth with explosions of BROWNIE and MINT when you sink your teeth right in. Wanna know about the topping? It’s just the coolest. It’s made out of an avocado. 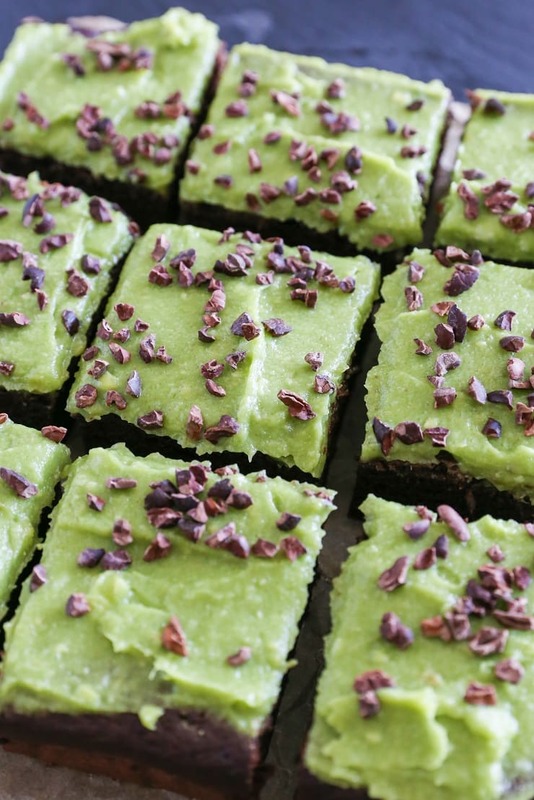 I modified the topping from the topping on these Mint Brownies from Natural Sweet Recipes. 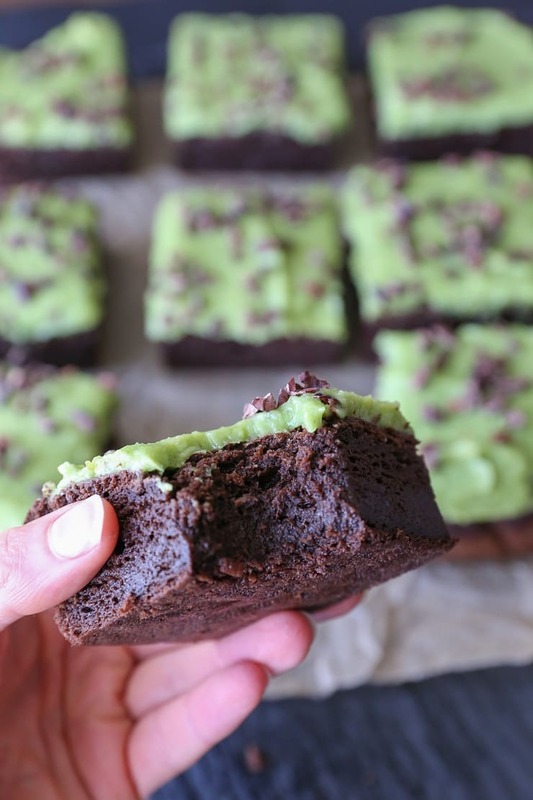 Nope, you can’t taste the avocado… yes, you can replace the avocado-based frosting with your favorite chocolate ganache, no I do not recommend doing as I did and OD-ing on these mint brownies. Okay, now for the mint talk. You guys, these are mintay! I was craving mint-chocolate like a LUNATIC prior to making these brownies, and am happy to report they quenched the craving with flying colors. You can dial the mint back a bit if you’d like, or brace yourself for an epic melt-in-your-mouth mint chocolate experience. I’ve kept you long enough for one post, but let me just leave you with this tidbit: You should make these for St. Patrick’s Day and share them with all your friends and have them try to guess what they’re made out of. C’moooon, it’ll be twice as fun as pin the tail on the donkey, and about 16 times safer. Preheat the oven to 350 degrees F. Lightly oil an 8"x8" baking pan, then line it with parchment paper. Add all of the ingredients for the brownies to a high-powered blender. Blend until completely smooth. Pour the batter into the prepared baking dish and smooth into an even layer. Bake 35 to 45 minutes, or until the center of the brownies sets up. Remove brownies from the oven and allow them to rest 1 hour at room temperature. While the brownies are cooling, prepare the mint topping. To do so, mash all of the ingredients very well together in a bowl or add everything to a small blender (I used my Magic Bullet) and blend until completely smooth. Refrigerate until ready to use. 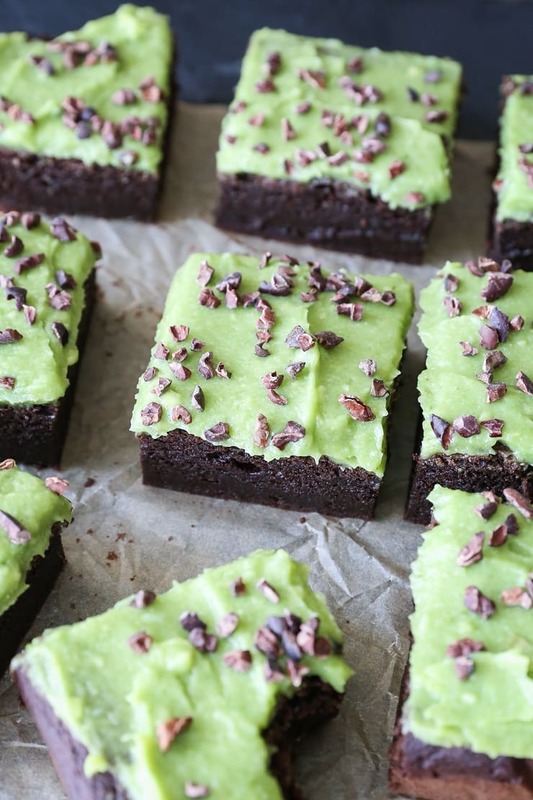 Once the brownies have cooled, spread the mint topping in an even layer. Sprinkle with cacao nibs, cut, and serve. Store any leftovers in a tupperware container in the refrigerator. Note: You can also freeze the mint brownies in a zip lock bag. Girl you have been KILLING it in the dessert dept. lately! These brownies look ridiculous. That texture…holy fudgy perfection. I’ve never baked with cassava or erythritol but these bad boys are making me want to deflower my flower too. If you catch my drift. Also that topping looks unreal. I need these in my face! Man oh man you’ve got me all sorts of intrigued now! My body handles sugar fine… I mean, as fine as sugar can be handled I suppose, but thanks for the lesson on sugar alcohols. I truly had no idea erythritol was even a thing. Alsooooo have never baked with cassava flour (not surprisingly)… BUT now I want to. This post made me laugh, and it was very relatable. Since my third baby, I’ve been struggling with how much sugar and starch I eat, even in the form of fruit! It’s definitely a drag. OH my gosh, Julia – these look incredible!!! That brownie base is perfection. Thanks for the shout-out for my mint frosting. I think I love your recipe more though because there is MORE OF IT. 😀 And as always, beautiful photography! Minty McMintsalot — I love it. 🙂 Thanks for entertaining me on a Monday! I haven’t tried Swerve or any other type of erythiritol sweetener, I normally use coconut sugar or maple syrup. BUT I hear you on how any type of sweetener affects your mood, etc. I crash and get cranky too! I’ll have to check it out…and I’ve never tried cassava flour. Two things to try in this one delicious brownie recipe! Wow. Awesome. 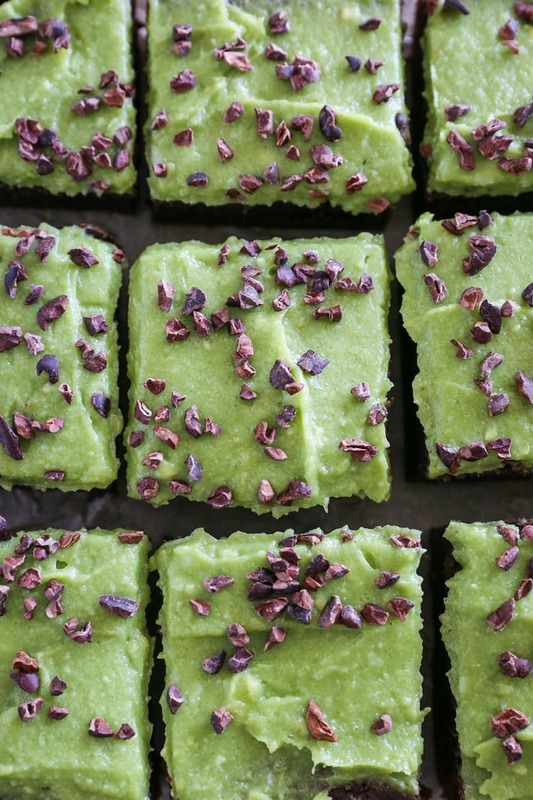 That avocado frosting!!! Question – do you think banana flour work in place of cassava flour!? These sound amazing! 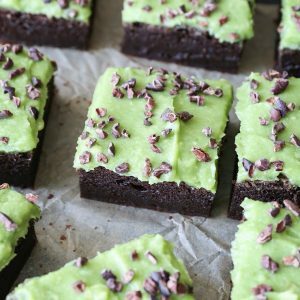 Question – I’ve never used avocado for something like frosting. How does it keep? If I wanted to make these and bring them into the office the next day, would the frosting be brown? Thanks, Shayna! The avocado actually kept pretty well for me. I used one that was just barely ripe, so still a little on the hard end, and it kept really nicely for me. With that said, I only kept the brownies for one day in the refrigerator and then I froze the rest of them. They freeze extremely well! I’d say the frosting will keep fine for a couple days, but if you still have leftovers after 2 days, I’d freeze the rest 🙂 Hope this helps! Enjoy! Ah, that’s a great question! I’ve actually never used banana flour, so I’m not sure what the conversion would be. Do you know if it absorbs as much liquid as cassava flour? I imagine you’d be able to use it, I’m just not sure how much. I can definitely let you know if/when I test the recipe using banana flour, though..in the meantime, let me know if you try it! Hahaha well if it makes you feel better I can’t say I’ve yet to incorporate either the flour or the sugar into my cooking/baking but I am also intrigued. However, I’m much on the same lines with the if you don’t need the sweet then just don’t add it. I’m intensely sensitive to sugar but more in a trigger-eat-everything sort of way. Your right though..it’s very hard to get past the deflowering part but otherwise your recipe looks great! what a day to be alive! came upon this recipe and the ingredients stated for this recipe is just different from the other brownie recipes that I came across. Lovely pictures there and thanks for sharing! This will be on my bucket list for this year! 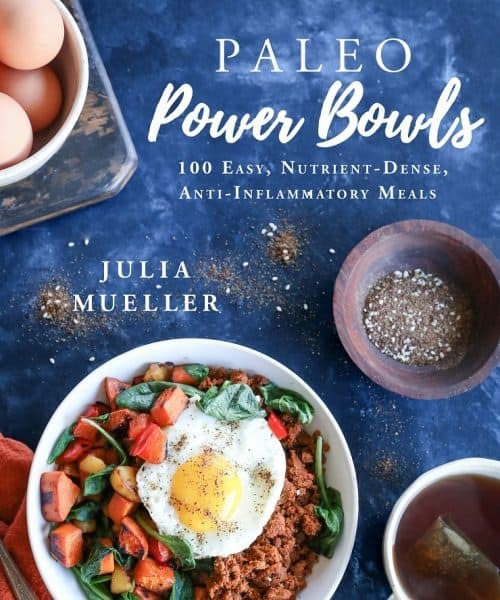 HI Julia – this recipe looks great; do you know if you could use Tiger Nut flour instead of Cassava flour and get approximately the same results? Thanks! I’ve heard that erythritol is commonly made with corn. I did some research a while back because I found myself reacting to Zevia. I would get terribly bloated and nauseous after drinking it and after research, I found that it’s not exclusively sweetened with stevia and often times they blend stevia with erythritol and don’t have to disclose it if it’s under a certain amount. However, I can tolerate Lakanto, a monk fruit-erythritol blend, in reasonable amounts with no gut issues. I guess my real question is, what is used to make the erythritol in Swerve and even Lakanto? It made sense to me that I was reacting to erythritol because I’m sensitive to grains, especially corn and corn-based products, but you mentioned it can be made with the by-products of peaches or even cauliflower. I find I’m a happier person inside and out if I don’t consume sugar, but it would be nice to have a treat once in a while!